Usually, we paid for iTunes so as to listen to music. And when it comes our favorite song, we'd like to set it as ringtone. But it's less than ideal to apply the whole songs and save them as your iPhone ringtones. An iPhone ringtone maker (preferably free) will be ideal for you to make personalized one for your iPhone. While googling, you will get tens of thousands of results like free online ringtone app, free websites, etc. Most of them are free of charge, but ask for registration, fill with advertisements, some even don't support YouTube links. So is there an iPhone ringtone maker that is both capable of creating and transferring ringtone to iPhone without any limitatiions? MacX MediaTrans supports you to directly trim and make ringtones for iPhone (XS/XR/X/8/7 Plus/SE/6S/6/5S/5) with simple mouse clicks once you connect your iPhone to your computer. Better still, it also empowers you to import music to iPhone in whatever audio format, for the iPhone manager has auto-audio converting feature to automatically encode any music to iPhone ringtone formats without any 3rd party help. It's also a stronger performer in music management (transfer music; delete unwanted music in batch; create music playlists, batch edit artist info etc.) and is expert in iPhone video backup, photo transfer, iBooks management and iPhone USB hard drive mounting, etc. Send ringtones to iPhone from Mac or transfer ringtones from iPhone to Mac. Add eBooks from Mac to iPhone and export iBooks to Mac in 4 formats. Prior to make a song a ringtone for iPhone, you need to check if you have already installed iTunes 12.3 or above, cuz this iPhone ringtone maker requires iTunes to detect iPhone and read iPhone file contents. But the whole process will be finished, without using iTunes. Click "Music Manager" on the main interface and you will see all your music songs are listed on the right side and the album categories are organized on the left side. Select your desirable music and point your mouse to it. Click "Click to Make Ringtone" to enter the ringtone trim window. Step 3 Trim Music to Customize Your Ringtones for iPhone. Free move the lines shown on the above picture to trim music ringtone at your will. The duration of iPhone ringtone is kept with 40 seconds. Then click "OK" and go back to main interface. Go back to the main interface and click "Voice & Ringtone" to check if your ringtone is successfully created. Then tab the Sync icon to add ringtones to iPhone. Worry about the audio format issues when transferring ringtones from Mac to iPhone? Don't be! Access to "Settings" in main interface → Click "Option" and you will see "Auto convert music format to MP3 or AAC" option. That means it will automatically convert any audio music to MP3, AAC, etc. iPhone supported audio formats. Also auto-video converting features infuses into this feature-rich iPhone ringtone maker. Whereas for jailbroken iPhone, it is not worth your effort to search for any free iPhone ringtone maker because you can directly download a free music app or download free iPhone ringtone in Cydia to make free iPhone ringtone. For those who are unwilling to jailbreak their iPhone, you can resort to free app online. The big issue is that although these apps claim that they provide you with a perfect solution to get the job done, the fact remains that either these cumbersome apps mess up the quality or they fail to support the latest iPhone like iPhone XS. They definitely don't deserve a spot on your iPhone. Here's a good news: few apps or third-party programs make ringtones for iPhone easily as this surprisingly robust iPhone ringtone downloader - MacX Video Converter Pro. Download audio songs free from Pandora, SoundCloud, Grooveshark, Spotify, and 300 more MP3 video download sites. You are free to customize downloaded iPhone ringtone and get the part you most want. Download music videos free from YouTube, Facebook, Vimeo, Vevo and extract MP3 from videos so as to set it as ringtone for your iPhone XS/XR/X/8/7/7 Plus/6S/6 etc. 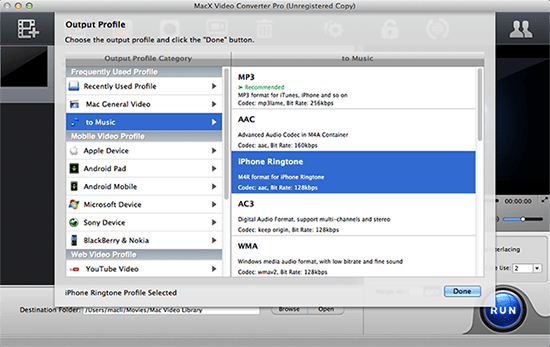 Convert songs videos in any format to iPhone ringtone M4R and other iPhone ringtone fromats like AAC, MP3, AC3, WMA etc. with more than 350 preset profile for Apple and Android devices. Step 1: Before making ringtones for iPhone, make sure that you have downloaded and launched it. Click the "Add File" button to load source file. Step 2: Choose an output format.You can just choose to "iPhone Ringtone" from "to Music" as the output format. Step 3: Select the output folder. Click the "Browse" button to select a folder to save the output files. Step 4: Start to make ringtone for iPhone.Click "RUN" to convert to iPhone ringtone format on your Mac. This iPhone ringtone maker will automatically finish conversion, and you could view the conversion progress and are able to cancel the converting process at anytime. 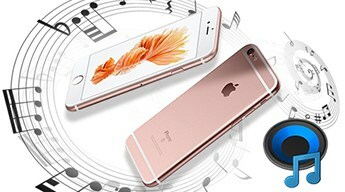 Wanna add ringtone to iPhone XS/XR/X/8/7/7 Plus/6S/6/SE/5S? In this tutorial, users can learn top three easy ways to put ringtone into iPhone as well as detailed steps to add ringtones to iPhone with the best iPhone ringtone manager. If you're missing important calls and messages because of your iPhone ringtones not working, don't worry. The solutions can be simple. This post will explain the main cause of iPhone ringtones stop ringing and show you how to fix it easily. MacX MediaTrans is an all-in-one iPhone ringtone maker to make ringtonefor iPhone without ringtone audio issues. And it also an excellent tool to transfer music, photos, videos, movies, iBooks, VoiceMemos, ringtones between iPhone and Mac.